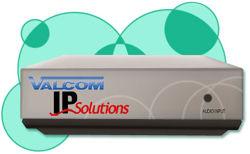 Click here to view Valcom's VIP-800 Networked Paging Zone Extender PDF. When dedicated wiring is not available or is too expensive, Valcom VoIP products provide LAN/WAN connectivity. The Valcom VIP-800 is used when a new paging system needs to be installed or an existing paging system needs to be expanded or extended. It provides line level audio output and control contact closure when paging. The VIP-810 is used with single line telephones to receive calls from 2-way intercom stations and handsets. It can dial any VoIP paging point(s) in the network for all call or specific group or zone loudspeaker paging. 1. VIP-810 connected to single line telephone (SLT) providing handset paging and 2-way intercom with remote stations. 2. VIP-800 connected to a zone of V-9022 1-way paging speakers and VP-6124 power supply. 3. VIP-810 connected to PagePac Station Doorphone providing ccll in to security phone and full 2-way intercom. 4. VIP-800 provides audio output and contact closure. Connection to remote amplifier may vary by manufacture and require additional components. Contact Valcom Tech Support for further assistance in determining exact requirements. 5. VIP-810 connected to SLT providing intercom capability with other handsets, PagePac Station DoorPhone intercom stations and full handset loudspeaker paging functionality. Click here to view Valcom's VoIP Loudspeaker Zone Paging over LAN/WAN PDF. Using the VIP-800 Audio Page Port to extend Valcom page controller zones to remote area loudspeakers. The Page Controller is connected to any PBX or Key System through FXO or Loop Start Trunk Port. Zone 1 and Zone 2 paging zones are On Premise and wired using structured cabling. Zone 3 and Zone 4 need to be extended Off Premise to remote areas using VIP-800s. The audio paging signal is then transported over the network and received by the associated VIP-800 in remote areas. Valcom VoIP adapters plug into the nearest LAN/WAN port in any location, providing the communications path to loudspeaker paging zones. User can access overhead paging from any PBX key telephone set(s) and send voice pages to local zones or those that are remote. Zones may be accessed in groups or facility wide ALL CALL. Install overhead loudspeaker paging in remote areas using you LAN/WAN without running new cabling! Network ALL your buildings for paging or extend paging zones to remote business locations without paying PSTN leased line charges! 1. PBX/FXO or Loop Start Trunk connected to Page Controller, providing Key telephone loudspeaker paging access. 2. Page Controller is connected to PBX/FXO Trunk providing PBX key telephone access for key phone voice paging. 3. VIP-800 connected to Zone 3 of the Page Controller. 4. VIP-800 connected to Zone 4 of the Page Controller. 5. VIP-800 programmed to receive Zone 3 voice pages and is used with SlimLine wall speakers and power supply. 6. VIP-800 programmed to receive Zone 4 voice pages and is used with Flexhorn speakers and power supply. Click here to view Valcom's Extending Loudspeaker Paging Signals over LAN/WAN PDF.